Hurricane Wilma hit Florida's southern west coast on 24 October 2005. THE PHRASE 'global warming' has become familiar to many people as one of the most important issues of our day. Many opinions have been expressed concerning it, from the doom-laden to the dismissive. This book aims to state the current scientific position on global warming clearly, so that we can make informed decisions on the facts. In the year 2060 my grandchildren will be approaching 70 years old; what will their world be like? Indeed, what will it be like during the 70 years or so of their normal lifespan? Many new things have happened in the last 70 years that could not have been predicted in the 1930s. The pace of change is such that even more novelty can be expected in the next 70. It seems certain that the world will be even more crowded and more connected. Will the increasing scale of human activities affect the environment? In particular, will the world be warmer? How is its climate likely to change? Before addressing future climate changes, what can be said about climate changes in the past? In the more distant past there have been very large changes. The last million years has seen a succession of major ice ages interspersed with warmer periods. The last of these ice ages began to come to an end about 20 000 years ago and we are now in what is called an interglacial period. Chapter 4 will focus on these times far back in the past. But have there been changes in the very much shorter period of living memory - over the past few decades? Variations in day-to-day weather are occurring all the time; they are very much part of our lives. The climate of a region is its average weather over a period that may be a few months, a season or a few years. Variations in climate are also very familiar to us. We describe summers as wet or dry, winters as mild, cold or stormy. In the British Isles, as in many parts of the world, no season is the same as the last or indeed the same as any previous season, nor will it be repeated in detail next time round. Most of these variations we take for granted; they add a lot of interest to our lives. Those we particularly notice are the extreme situations and the climate disasters (for instance, Figure 1.1 shows the significant climate events and disasters during the year 1998 - one of the warmest years on record). Most of the worst disasters in the world are, in fact, weather- or climate-related. Our news media are constantly bringing them to our notice as they occur in different parts of the world - tropical cyclones (called hurricanes or typhoons), windstorms, floods and tornadoes, also droughts whose effects occur more slowly, but which are probably the most damaging disasters of all. Figure 1.1 Significant climate anomalies and events during 1998 as recorded by the Climate Prediction Center of the National Oceanic and Atmospheric Administration (NOAA) of the United States. The period has also been remarkable (just how remarkable will be considered later) for the frequency and intensity of extremes of weather and climate. Let me give a few examples. An extremely unusual heatwave in central Europe occurred in the summer of 2003 and led to the premature deaths of over 20 000 people (see Chapter 7, page 215). Periods of unusually strong winds have been experienced in western Europe. During the early hours of the morning of 16 October 1987, over 15 million trees were blown down in southeast England and the London area. The storm also hit northern France, Belgium and the Netherlands with ferocious intensity; it turned out to be the worst storm experienced in the area since 1703. Storm-force winds of similar or even greater intensity but covering a greater area of western Europe have struck since - on four occasions in 1990 and three occasions in December 1999. Hurricane Mitch was one of the deadliest and most powerful hurricanes on record in the Atlantic basin, with maximum sustained winds of 180 mph (290 km h-1). The storm was the thirteenth tropical storm, ninth hurricane and third major hurricane of the 1998 Atlantic hurricane season. Figure 1.2 The total economic costs and the insured costs of catastrophic weather events for the period 1950 to 2004 as recorded by the Munich Re insurance company. For 2005, because of Hurricane Katrina in the USA the figures are off the page - over $US200 billion for economic losses and over $US80 billion for insured losses. Both costs show a rapid upward trend in recent decades. The number of non-weather-related disasters is included for comparison. Tables 7.3 and 7.4 in Chapter 7 provide some regional detail and list some of the recent disasters with the greatest economic and insured losses. effect of intensely low atmospheric pressure, extremely strong winds and high tides causes a surge of water which can reach far inland. In one of the worst such disasters in the twentieth century over 250 000 people were drowned in Bangladesh in 1970. The people of that country experienced another storm of similar proportions in 1999 as did the neighbouring Indian state of Orissa also in 1999, and smaller surges are a regular occurrence in that region. 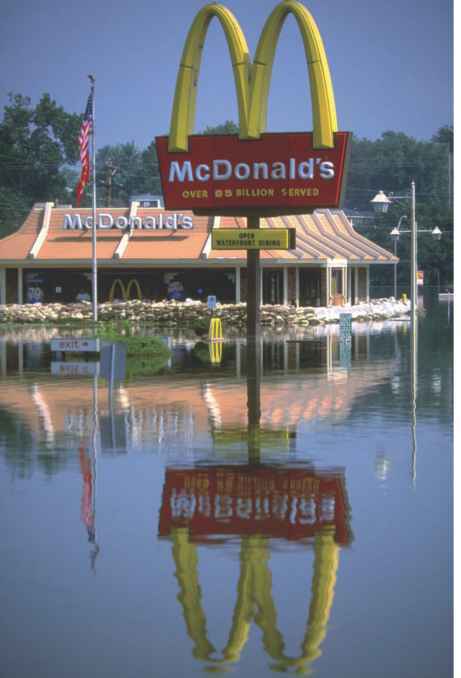 Flooded McDonald's, Festus, Missouri in 1993. The spot where this photo was taken is nearly 1.5 miles (2.5 km) and 30 feet (9 m) above the river. to the growth in population in particularly vulnerable areas and to other social or economic factors; the world community has undoubtedly become more vulnerable to disasters. However, a significant part of it has also arisen from the increased storminess in the recent years compared with the 1950s. Windstorms or hurricanes are by no means the only weather and climate extremes that cause disasters. Floods due to unusually intense or prolonged rainfall or droughts because of long periods of reduced rainfall (or its complete absence) can be even more devastating to human life and property. These events occur frequently in many parts of the world especially in the tropics and sub-tropics. There have been notable examples during the last two decades. Let me mention a few of the floods. 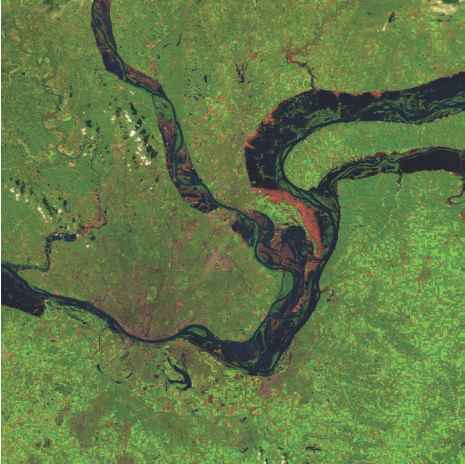 In 1988, the highest flood levels ever recorded occurred in Bangladesh, and 80% of the entire country was affected; China experienced devastating floods affecting many millions of people in 1991, 1994-5 and 1998; in 1993, flood waters rose to levels higher than ever recorded in the region of the Mississippi and Missouri rivers in the United States, flooding an area equivalent in size to one of the Great Lakes; major floods in Venezuela in 1999 led to a large landslide and left 30 000 people dead; two widespread floods in Mozambique occurred within a year in 2000-1 leaving over half a million homeless; and in the summer of 2002 Europe experienced its worst floods for centuries. Droughts during these years have been particularly intense and prolonged in areas of Africa, both north and south. It is in Africa especially that they bear on the most vulnerable in the world, who have little resilience to major disasters. Figure 1.3 shows that in the 1980s droughts accounted for more deaths in Africa than all other disasters added together and illustrates the scale of the problem. 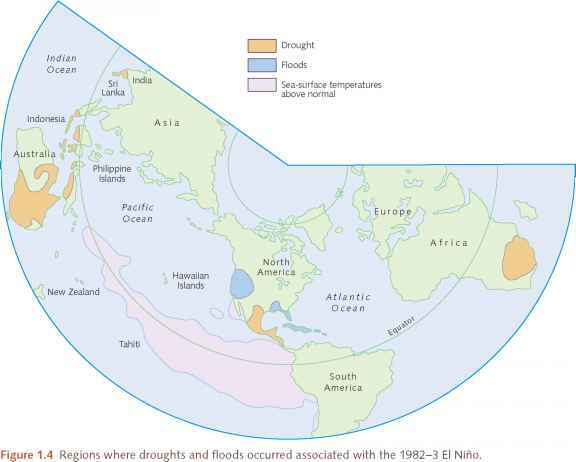 Rainfall patterns which lead to floods and droughts especially in tropical and semi-tropical areas are strongly influenced by the surface temperature of the oceans around the world, particularly the pattern of ocean surface temperature in the Pacific off the coast of South America (see Chapter 5 and Figure 5.9). About every three to five years a large area of warmer water appears and persists for a year or more. Because they usually occur around Christmas these are known as El Niño ('the boy child') events.3 They have been well known for centuries to the countries along the coast of South America because of their devastating effect on the fishing industry; the warm top waters of the ocean prevent the nutrients from lower, colder levels required by the fish from reaching the surface. The Great Flood of 1993 occurred in the American Midwest, along the Mississippi and Missouri rivers from April to October 1993. The flood was among the most costly and devastating to ever occur in the United States, with $US15 billion in damages, and a flooded area of around 30 000 square miles (80 000 km2). 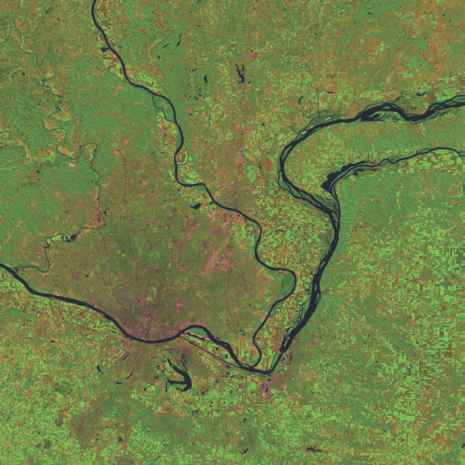 These images from Landsat-5 Thematic Mapper show the Mississippi near St Louis before and during the flood. are probably linked with this unusually protracted El Niño. This, the longest El Niño of the twentieth century, was followed in 1997-8 by the century's most intense El Niño which brought exceptional floods to China and to the Indian sub-continent and drought to Indonesia - that in turn brought extensive forest fires creating an exceptional blanket of thick smog which was experienced over 1000 miles away (Figure 1.1). 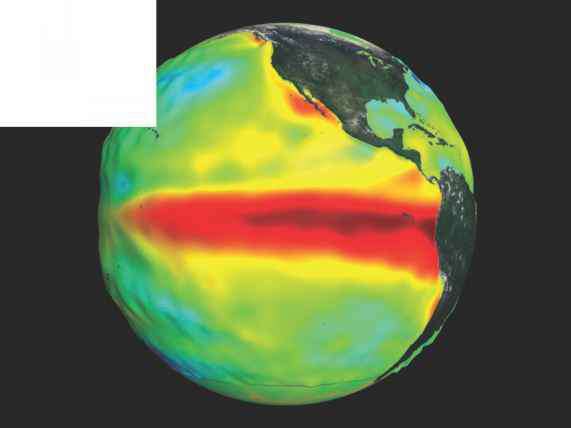 Studies with computer models of the kind described later (in Chapter 5) provide a scientific basis for links between the El Niño and these extreme weather events; they also give some confidence that useful forecasts of such disasters will in due course be possible. A scientific question that is being urgently addressed is the possible link between the character and intensity of El Niño events and global warming due to human-induced climate change. Natural events such as volcanoes can also affect the climate. Volcanoes inject enormous quantities of dust and gases into the upper atmosphere. Large amounts of sulphur dioxide are included, which through photochemical reactions using the Sun's energy are transformed to sulphuric acid and sulphate particles. Typically these particles remain in the stratosphere (the region of atmosphere above about 10 km in altitude) for several years before they fall into the lower atmosphere and are quickly washed out by rainfall. During this period they disperse around the whole globe and cut out some of the radiation from the Sun, thus tending to cool the lower atmosphere. One of the largest volcanic eruptions in the twentieth century was that from Mount Pinatubo in the Philippines on 12 June 1991 which injected about 20 million tonnes of sulphur dioxide into the stratosphere together with enormous amounts of dust. This stratospheric dust caused spectacular sunsets around the world for many months following the eruption. The amount of radiation from the Sun reaching the lower atmosphere fell by about 2%. Global average temperatures lower by about a quarter of a degree Celsius were experienced for the following two years. There is also evidence that some of the unusual weather patterns of 1991 and 1992, for instance unusually cold winters in the Middle East and mild winters in western Europe, were linked with effects of the volcanic dust. Over the centuries, although different human communities have adapted to their particular climate, any large change to the average climate tends to bring stress of one kind or another. It is particularly the extreme climate events and climate disasters that emphasise the importance of climate to our lives and that demonstrate to countries around the world their vulnerability to climate change - a vulnerability that is enhanced by rapidly increasing world population and demands on resources. Figure 1.3 Recorded disasters in Africa, 1980-9, estimated by the Organization for African Unity. Note the logarithmic scale. But the question must be asked: how remarkable are these extreme events that I have been listing? Do they point to a changing climate due to human activities? Here a note of caution must be sounded. The range of normal natural climate variation is large. Climate extremes are nothing new. Climate records are continually being broken. In fact, a month without a broken record somewhere would itself be something of a record! Many of us may remember the generally cold period over large areas of the world during the 1960s and early 1970s that caused speculation that the world was heading for an ice age. A British television programme about climate change called 'The ice age cometh' was prepared in the early 1970s and widely screened - but the cold trend soon came to an end. We must not be misled by our relatively short memories. The El Niño event of 1997-8 is the most intense on record. One result was the drought that led to forest fires in Asia, which burned thousands of square miles of rainforest, plantations, conversion forest and scrubland in Indonesia alone. The above shows a superposition of sea surface temperature anomalies on anomalies of the sea surface elevation, showing warm water building up eastwards across the Pacific Ocean and reaching South America. We may be sure about the warming that has occurred over the last few decades but do we have the evidence that this is linked with the development of human industry over the last 200 years? To identify climate change related to this development, we need to look for trends in global warming over similar lengths of time. They are long compared with both the memories of a generation and the period for which accurate and detailed records exist. Although, therefore, it can be ascertained that there was more storminess, for instance, in the region of the north Atlantic during the 1980s and 1990s than in the previous three decades, it is difficult to know just how exceptional those decades were compared with other periods in previous centuries. There is even more difficulty in tracking detailed climate trends in many other parts of the world, owing to the lack of adequate records; further, trends in the frequency of rare events are not easy to detect. What is important is continually to make careful comparisons between practical observations of the climate and its changes and what scientific knowledge leads us to expect. During the last few years, as the occurrence of extreme events has made the public much more aware of environmental issues,4 scientists in their turn have become more sure about just what human activities are doing to the climate. Later chapters will look in detail at the science of global warming and at the climate changes that we can expect, as well as investigating how these changes fit in with the recent climate record. First, however, I present a brief outline of our current scientific understanding. We know for sure that because of human activities, especially the burning of fossil fuels, coal, oil and gas, together with widespread deforestation, the gas carbon dioxide has been emitted into the atmosphere in increasing amounts over the past 200 years and more substantially over the past 50 years. Every year these emissions currently add to the carbon already present in the atmosphere a further 8000 million tonnes, much of which is likely to remain there for a period of 100 years or more. Because carbon dioxide is a good absorber of heat radiation coming from the Earth's surface, increased carbon dioxide acts like a blanket over the surface, keeping it warmer than it would otherwise be. With the increased temperature the amount of water vapour in the atmosphere also increases, providing more blanketing and causing it to be even warmer. The gas methane is also increasing because of different human activities, for instance mining and agriculture, and adding to the problem. Being kept warmer may sound appealing to those of us who live in cool climates. However, an increase in global temperature will lead to global climate change. If the change were small and occurred slowly enough we would almost certainly be able to adapt to it. However, with rapid expansion taking place in the world's industry the change is unlikely to be either small or slow. The estimate I present in later chapters is that, in the absence of efforts to curb the rise in the emissions of carbon dioxide, the global average temperature will rise by about a third of a degree Celsius or more every ten years - or three or more degrees in a century. This may not sound very much, especially when it is compared with normal temperature variations from day to night or between one day and the next. But it is not the temperature at one place but the temperature averaged over the whole globe. The predicted rate of change of 3 °C a century is probably faster than the global average temperature has changed at any time over the past 10 000 years. And as there is a difference in global average temperature of only about five or six degrees between the coldest part of an ice age and the warm periods in between ice ages (see Figure 4.6), we can see that a few degrees in this global average can represent a big change in climate. It is to this change and especially to the very rapid rate of change that many ecosystems and human communities (especially those in developing countries) will find it difficult to adapt. Not all the climate changes will in the end be adverse. While some parts of the world experience more frequent or more severe droughts, floods or significant sea level rise, in other places crop yields may increase due to the fertilising effect of carbon dioxide. Other places, perhaps for instance in the sub-arctic, may become more habitable. Even there, though, the likely rate of change will cause problems: large damage to buildings will occur in regions of melting permafrost, and trees in sub-arctic forests like trees elsewhere will not have time to adapt to new climatic regimes. Scientists are confident about the fact of global warming and climate change due to human activities. However, uncertainty remains about just how large the warming will be and what will be the patterns of change in different parts of the world. Although useful indications can be given, scientists cannot yet say in precise detail which regions will be most affected. 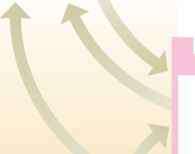 Intensive research is needed to improve the confidence in scientific predictions. An integrated view of anthropogenic climate change is presented in Figure 1.5 where a complete cycle of cause and effect is shown. Begin in the box at the bottom where economic activity, both large and small scale, whether in developed or developing countries, results in emissions of greenhouse gases (of which carbon dioxide is the most important) and aerosols. Moving in a clockwise direction around the diagram, these emissions lead to changes in atmospheric concentrations of important constituents that alter the energy input and output of the climate system and hence cause changes in the climate. These climate changes impact both humans and natural ecosystems altering patterns of resource availability and affecting human livelihood and health. These impacts in their turn affect human development in all its aspects. 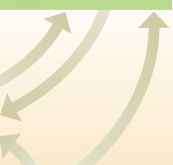 Anticlockwise arrows illustrate possible development pathways and global emission constraints that would reduce the risk of future impacts that society may wish to avoid. Figure 1.5 Climate change - an integrated framework (see text for explanation). Adaptation and mitigation is aimed at reducing the causes of climate change, in particular the emissions of the gases that give rise to it. Predictions of the future climate are surrounded with considerable uncertainty which arises from our imperfect knowledge both of the science of climate change and of the future scale of the human activities that are its cause. Politicians and others making decisions are therefore faced with the need to weigh all aspects of uncertainty against the desirability and the cost of the actions that can be taken in response to the threat of climate change. Some mitigating action can be taken easily at relatively little cost (or even at a net saving of cost), for instance the development of programmes to conserve and save energy, and many schemes for reducing deforestation and encouraging the planting of trees. Other actions such as a large shift to energy sources that are free from significant carbon dioxide emissions (for example, renewable sources: biomass, hydro, wind or solar energy) both in the developed and the developing countries of the world will take some time. Because, however, of the long timescales that are involved in the development of new energy infrastructure and in the response of the climate to emissions of gases like carbon dioxide, there is an urgency to begin these actions now. As we shall argue later (Chapter 9), to 'wait and see' is an irresponsible response. In the following chapters I shall first explain the science of global warming, the evidence for it and the current state of the art regarding climate prediction. I shall then go on to say what is known about the likely impacts of climate change - on sea level, extreme events, water and food supplies, for instance. The questions of why we should be concerned for the environment and what action should be taken in the face of scientific uncertainty are followed by consideration of the technical possibilities for large reductions in the emissions of carbon dioxide and how these might affect our energy sources and usage, including means of transport. Finally I will address the issue of the 'global village'. So far as the environment is concerned, national boundaries are becoming less and less important; pollution in one country can now affect the whole world. Further, it is increasingly realised that problems of the environment are linked to other global problems such as population growth, poverty, the overuse of resources and global security. All these pose global challenges that must be met by global solutions. 1 Look through recent copies of newspapers and magazines for articles that mention climate change, global warming or the greenhouse effect. How many of the statements made are accurate? 2 Make up a simple questionnaire about climate change, global warming and the greenhouse effect to find out how much people know about these subjects, their relevance and importance. Analyse results from responses to the questionnaire in terms of the background of the respondents. Suggest ways in which people could be better informed. Walker, Gabrielle and King, Sir David. 2008. The Hot Topic. London: Bloomsbury. A masterful paperback on climate change for the general reader covering the science, impacts, technology and political solutions. 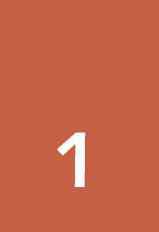 1 Summary for policymakers, p. 5 in Solomon, S., Qin, D., Manning, M., Chen, Z., Marquis, M., Averyt, K. B., Tignor, M., Miller, H. L. (eds.) 2007. Climate Change 2007: The Physical Science Basis. Contribution of Working Group 1 to the Fourth Assessment Report of the Intergovernmental Panel on Climate Change. Cambridge: Cambridge University Press. 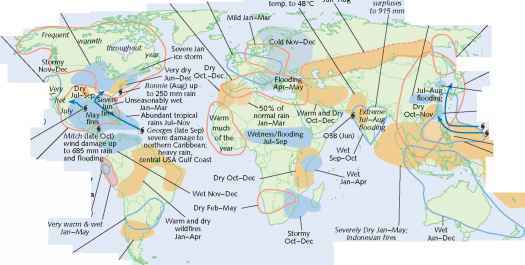 2 Including windstorms, hurricanes or typhoons, floods, tornadoes, hailstorms and blizzards but not including droughts because their impact is not immediate and occurs over an extended period. 3 A description of the variety of El Niño events and their impacts on different communities worldwide over centuries of human history can be found in a paperback by Ross Couiper-Johnston, El Niño: The Weather Phenomenon that Changed the World. 2000. London: Hodder and Stoughton. 4 A gripping account of some of the changes over recent decades can be found in a book by Mark Lynas, High Tides: News from a Warming World. 2004. London: Flamingo.